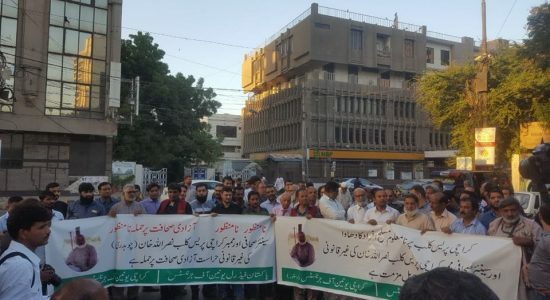 A journalist’s murder is among 11 cases in seven threat categories including detention, harassment, injuries, verbal threats and legal cases against journalists in three provinces – Khyber Pakhtunkhwa, Punjab and Sindh – while in Balochistan no case was reported during December 2018 period under Pakistan Press Club Safety Hub Network, managed by award-winning media watchdog organization Freedom Network. Islamabad-based press freedom organization Freedom Network is assisting journalists at risks in four different categories in partnership with eight press clubs in Karachi, Lahore, Quetta, Islamabad and Peshawar besides Khuzdar in Balochistan, Landikotal and Sukkur under Pakistan Press Club Safety Hub Network programme since February 2016. KILLED: Based in Nowshera district in Khyber Pakhtunkhwa province, young journalist Noor-ul-Hasan, working for Roze TV channel, was gunned down in Peshawar on November 3 in what appeared a target-killing. The attackers, according to Mehmood Khan, brother of the deceased journalist, were on motorcycle and they targeted the journalist. Khan told Freedom Network that Hasan did not receive any threat before his murder. Motive of the journalist’s killing has not yet been confirmed. DETAINED: Police and security agency personnel detained journalist Mansoor Ali Khan, Resident Editor of The Nation newspaper in Karachi on December 9. However, the journalist was released after his community strongly protested his detention. The Editor said he told police that he was a journalist sharing documents to prove his identity. The police still detained him for several hours citing no reason. The journalist was returning from coverage of MQM party. HARASSMENT: Police raided ailing journalist Shibar Azmi’s home in Karachi on December 10. “They security agency personnel and police showed no search warrant harassing family members and the journalist who is on wheel-chair, said the family members. “Police provided no ground for searching the journalist’s home without following due course of law,” they added. ASSAULT: Muhammad Ali Naqaj, senior journalist working with Daily Awami Awaz in Karachi, was attacked in Korangi area of the city on December 11 when he was returning to home. The attack on the journalist comes after he filed stories on drug and Korangi is home to gangs involved in heinous crimes. “Drug mafia has threatened me for reporting drugs,” the journalist told Freedom Network. Police registered First Information Report the same day. No arrest was made till the filing of this report. INJURED: Three journalists – Ghazi Bajeer, reporter of Awami newspaper, Sijawal, reporter of Sobh newspaper and Sudher Rathore, reporter of Sindh TV channel – received injuries after they were attacked while covering anti-encroachment drive in Mithi Tharparkar district in Sindh province on December 25. It was said some officials of Anti-Encroachment Force reached the operation site after civil society and affected citizens protested the demolition and they attacked the three journalists. No reason was given why the officials targeted these journalists. The issue was taken up with the Sindh government and Sindh government adviser on media Murtaza Wahib called senior police official Mithi to submit a report on torture of the journalists. On December 17, Samaa TV channel cameraman Sayed Wajid Ali Shah was attacked by private security guards of former prime minister Nawaz Sharif as he was covering him while he was coming out of Parliament building. As one guard pushed the cameraman who fell down another kicked him in his face causing injuries to his nose and the journalist was immediately taken to hospital. Police arrested the former prime minister’s guard after a case was registered. VERBAL THREATS: Reporter Farhan Hussain of Daily Pakistan reported on December 18 receiving “threatening calls” from police and their “touts” after publishing reports about land mafia in Rawalpindi. The issue was taken up with the senior police official and an inquiry was ordered against the alleged perpetrators of the crime. LEGAL CASES: Police in Dera Ismail Khan district in Khyber Pakhtunkwa province registered on December 11 a case against senior journalist Sailab Mehsud for covering Pashtoon Tahafuz Movement (PTM)-held rally. On December 31, Justice Asif Saeed Khan Khosa of the Supreme Court dismissed appeal against acquittal of journalist Akhlaq Jokhiyo of Naushero Feroze district in Sindh province by the Sindh High Court. The journalist faced jail after lower court convicted him after he ran stories on land mafia in the district. Pakistan Electronic Media Regulatory Authority (PEMRA) issued 22 show-cause notices, warnings and advices to television channels during December 2018. Neo TV was served show-cause notice for “derogatory remarks” against an ethnic community while Geo News, Dunya News, Aaj News, Express News, Neo News, 24 News, BOL News, 7 News, Metro 1, Hum News, ARY News, Samaa News, Public News, 92 News, GNN News, Channel 5 and K21 News were issued notices for “fake news” while Channel 24 and AbbTak were alleged to have aired “derogatory slogans.” BOL TV was warned against airing “derogatory remarks” against Federal Minister for Communication and Postal Services Murad Saeed. PEMRA also issued advisory to all TV channels regarding “fake news, news or discussion on sub judice matters, crime reporting and urging them to build “positive image” of Pakistan. Of the total 11 cases of violations nine involved print media journalists and three TV journalists. In seven out of 11 cases state authorities – police and anti-encroachment force personnel – were involved while two cases criminal gangs suspected and one case Pakistan Muslim League (N) was the alleged perpetrator of the crime. Caption: Journalists protest raid on Karachi Press Club and arrest of colleague Nasrullah Khan by security personnel.